(CBS/AP) Johnson & Johnson says it will remove carcinogenic chemicals and other potentially harmful substances from nearly all its adult toiletries and cosmetic products worldwide within 3.5 years. The health care giant late last year pledged to remove "chemicals of concern" from its baby products sold around the world after being pressed to do so for more than three years by a large coalition of health and environmental groups. Groups at the time alleged chemicals found in products such as the company's popular No More Tears baby shampoo released the carcinogen formaldehyde. 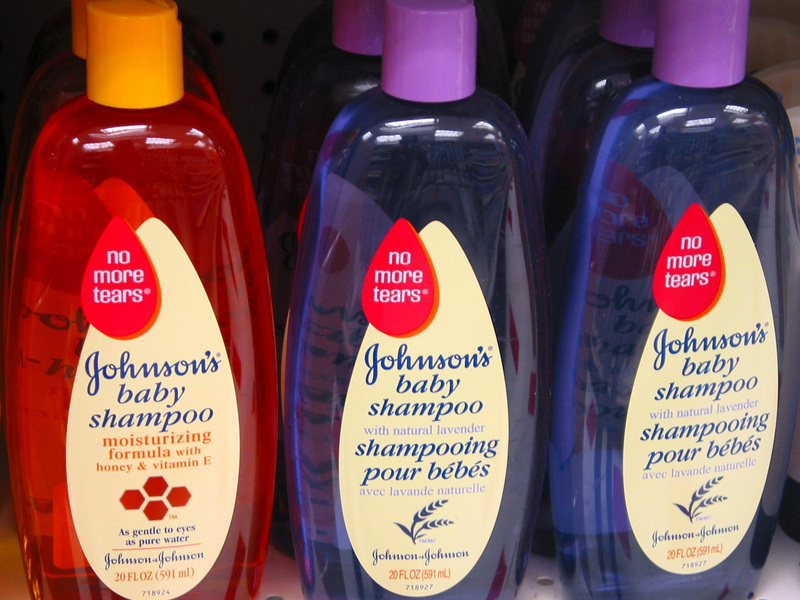 Johnson & Johnson told The Associated Press in an exclusive interview Tuesday that it remains on track to have baby products, including the shampoo, reformulated with safer ingredients by the end of 2013. Adult products will be reformulated by the end of 2015. "We want people to have complete peace of mind when they use our products," said Susan Nettesheim, vice president of product stewardship and toxicology for J&J's consumer health brands. Those include Johnson's baby lotion and bath products and Desitin for diaper rash, as well as adult skin care brands including Aveeno, Neutrogena, RoC, Clean & Clear and Lubriderm. J&J, based in New Brunswick, N.J., also makes prescription drugs and medical devices. The Campaign for Safe Cosmetics began pushing J&J in May 2009 to remove harsh and toxic chemicals from its brands to protect consumers and workers. The coalition includes more than 175 nonprofit groups representing about 1.7 million members, from the Environmental Working Group and Friends of the Earth to the American Nurses Association and Physicians for Social Responsibility. "This is a good step in the right direction," said Lisa Archer, the campaign's national director. "In terms of the cosmetic giants, Johnson & Johnson is going the furthest of any of them in removing chemicals of concern." Johnson & Johnson launched a website Wednesday morning, telling consumers what it does to ensure its ingredients are safe and of high quality. That includes detailed questioning of manufacturers and suppliers covering everything from the composition of ingredients and any trace chemicals in them to their environmental health and safety practices. "We've heard from consumers that they want to understand more about our plans" for improving products, Nettesheim said. "They want more transparency." Research by the Environmental Working Group found most cosmetic and personal care products - other than those from small companies in the fast-growing natural products niche - contain potentially dangerous chemicals. The chemicals in question are 1,4 dioxane and the preservative formaldehyde, which is slowly released by a chemical called quaternium-15 to kill bacteria. Both 1,4 dioxane and formaldehyde are probable human carcinogens; formaldehyde also is a skin, eye and respiratory irritant. By 2015, J&J will phase out those two chemicals and others of concern, including triclosan, phthalates and parabens, as well as fragrance ingredients, which aren't disclosed on product labels. However, it will allow chemicals that release formaldehyde when no safe alternative will work and is reducing levels of 1,4 dioxane to below 10 parts per million. "Many of our products will be ahead of this timing," Nettesheim said, noting its products already met or exceeded regulatory limits. However, the U.S. Food and Drug Administration doesn't regulate cosmetic products. Nettesheim said the effort is taking several years for a few reasons. The company has many different formulas for products sold in different countries around the world - including some safer formulas in products long sold outside the United States. Each ingredient replacing an objectionable one must go through quality testing and be evaluated by volunteer consumers, and many must be registered with government agencies. J&J said that since 2010, it's reduced the number of products containing chemicals that release formaldehyde by 33 percent and the products that contain 1,4 dioxane by 74 percent. In 2005 it launched the Johnson's Soothing Naturals line, products with no 1,4 dioxane and or formaldehyde-releasing chemicals. That evolved into Johnson's Natural baby products. The Campaign for Safe Cosmetics has issued multiple reports documenting its concerns. Its site has links to tips on shopping for the safest products and a searchable database with information on ingredients and potential hazards of about 75,000 personal care products. Concerns over chemicals in beauty care products, particularly those for vulnerable babies, led the campaign to announce plans last November for a consumer boycott of J&J products. That was scrapped before it began because Johnson & Johnson quickly agreed to make its baby products safer. The public debate led to some spoof ads widely circulated on the Internet for a product called "Nothing But Tears" shampoo with taglines such as "Formulated to scrub clean any vestiges of naivete." Archer said her group now will renew its push for several major cosmetics companies with bigger market share than Johnson & Johnson to commit to making their products safer. The moves by Johnson & Johnson come as it tries to restore its image after an embarrassing, costly series of more than 30 product recalls since 2009, mostly of consumer products including nonprescription Tylenol, Motrin, Benadryl and Mylanta. Problems ranging from wrong levels of active ingredient and nauseating package odors to tiny shards of glass and metal in liquid medicines forced the company to gut and rebuild a consumer health products factory in Pennsylvania. That factory and two others are getting extra scrutiny under an agreement with the FDA. The company's hip implantshave also come into question over risks of toxic metals seeping into patients' bloodstreams, causing infection and other health problems.